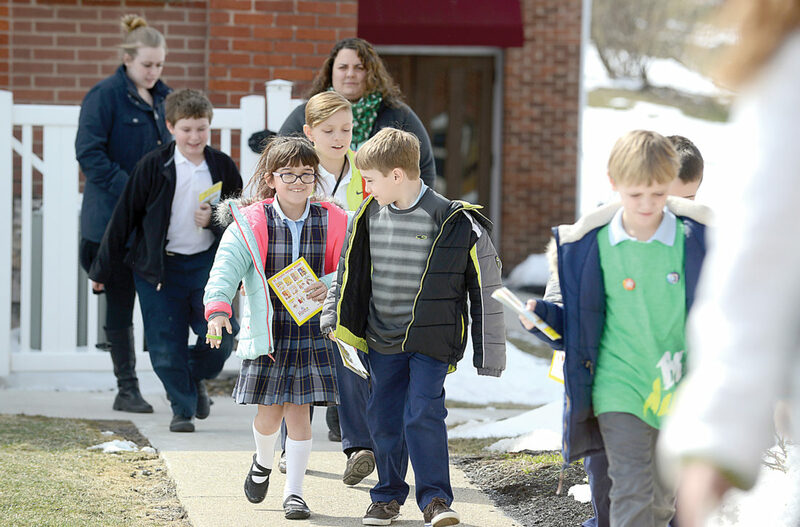 Mirror photo by Patrick Waksmunski Students at Holy Trinity Catholic School in Hollidaysburg walk to the school after attending a Stations of the Cross service at St. Michael the Archangel Catholic Church on Friday afternoon. Families have alternatives to public school districts if they want them, but whether they can actually obtain them is another matter. Tens of thousands of students are on waiting lists for publicly funded charter schools in Philadelphia, according to Great Philly Schools website. Tens of thousands of families statewide don’t have the financial means to afford private school, said Sen. John H. Eichelberger Jr., R-Blair. Eichelberger, Pennsylvania Senate Education Committee chairman, said families want more educational choices than their public school district; and he said families in Pennsylvania would welcome help from the president. President Donald Trump has called education “the civil rights issue of our time” and has pushed for legislation that eliminates hurdles families face in enrolling their children in schools they want. However, federal impact on school choice is debatable. “School choice is a flash in the pan to distract from bigger issues in education,” Penn State Education Policy Studies Department professor Dana Mitra said. In Pennsylvania, tax credit scholarships helped nearly 50,000 students attend a school of their choice in 2014-15, according to the conservative-leaning Commonwealth Foundation. Seventeen states, according to the National Conference of State Legislatures, have tax credit scholarship programs. Additional states have voucher programs or direct funding of private schools, but tax credit systems are a more indirect way of funding private schools, which leads to fewer problems with state constitutions over funding religious schools, Pennsylvania American Civil Liberty Union attorney Sara Rose said. “However, a tax credit program does take money out of the state budget that would otherwise be in public schools. I think that is something our legislators should think about. Obviously, we’ve had budget problems in the last couple years,” she said. In early March, Trump visited a Catholic School in Florida where a tax credit scholarship program has increased academic achievement of scholarship recipients — mostly low income, minority students. In addition, the system improved performance of public schools most likely to lose students to private schools, according to the American Federation for Children. The 2016-17 Private School Choice ranking by the American Federation for Children ranks Florida’s tax credit scholarship program No. 1 of 16 programs nationwide. Pennsylvania has two tax credit scholarship programs, which the federation ranks No. 8 and No. 15. Pennsylvania and Florida’s programs both give tax credits to corporations that donate to nonprofit scholarship organizations. The Altoona-Johnstown Diocese’s Second Century fund is an example of a scholarship organization approved by the state’s tax credit scholarship program. In February, the diocese’s fund surpassed the $14 million mark with a contribution from Allegheny Orthodontics Associates of Hollidaysburg. Where Pennsylvania and Florida’s programs differ is on student eligibility, accountability required of private schools that receive scholarships, scholarship amounts, the tax credit value to the donors and the statewide cap on tax credits available, according to the federation. The average scholarship amounts differ greatly. In Florida the average scholarship is $5,629. Pennsylvania has two programs — the Educational Improvement Tax Credit program and Educational Opportunity Scholarship Tax Credit program specifically for children in low performing school districts. In Pennsylvania, the average EITC scholarship is $1,684 and the Opportunity Scholarship is $2,300, which is still only about 19 percent of the state and local per-pupil average for public school students, a report by the American Federation for Children states. A plan to increase the scholarships by raising the caps on both of the state’s tax credit scholarship programs was proposed in the Pennsylvania House of Representatives in January. House Bill 250’s sponsors are bipartisan. It’s been in the House appropriations committee since Feb. 8. Under the proposal, the total amount of tax credits approved for contributions from business firms to scholarship organizations per fiscal year would be raised. Despite attention from the White House, the federal impact on school choice wouldn’t be far reaching said Rose at the American Civil Liberty Union. “The purse strings for education are really controlled at the state level,” she said. However, the federal government may have some power over regulations and incentive programs like the Race to the Top grant under the Obama administration, Rose said. Mitra at Penn State agreed. “In order to do anything more than a demonstration program, the amount of money to switch all kids to a charter or private school would be very large,” she said. Mitra said she thinks there are bigger issues in education than school choice that Trump should work on for positioning children for success in the Rust Belt communities that elected him. “If you want to stay and can get a degree in teaching for example, you will probably have to move to Virginia or North Carolina. If you want to stay in western Pennsylvania, you are going to have to go into a field such as welding or nursing,” she said. 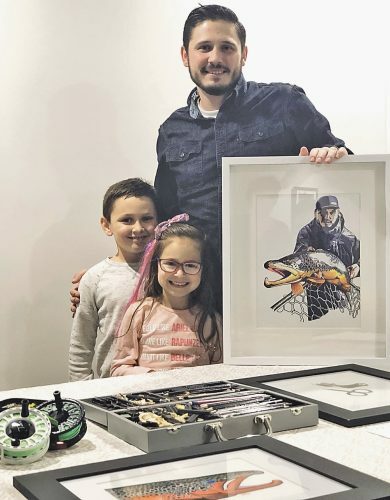 “There are things that can be done cheaply to help kids learn what jobs are available in communities instead of expecting the mills are going to come back to Johnstown,” Mitra said.